September 4, 2015 – NASA’s Magnetospheric Multiscale (MMS) mission successfully completed commissioning activities on September 1, 2015, and is now in full science mode. During the next six months, the four spacecraft will fly in an adjustable, pyramid formation that will skim Earth’s magnetosphere – the magnetic bubble surrounding Earth – right at the boundary where it interacts with the constant wind of solar particles streaming in from the sun. Here, as the sun’s magnetic fields interact with those that surround Earth, explosive reconnection events happen. MMS, with its four spacecraft each carrying an identical set of 11 instruments, will be able to observe the 3-dimensional structure of magnetic reconnection and, because the four MMS spacecraft orbits can be changed individually, scientists can adjust the distance among the four spacecraft, giving MMS the necessary observational perspective to study magnetic reconnection on a variety of different spatial scales. 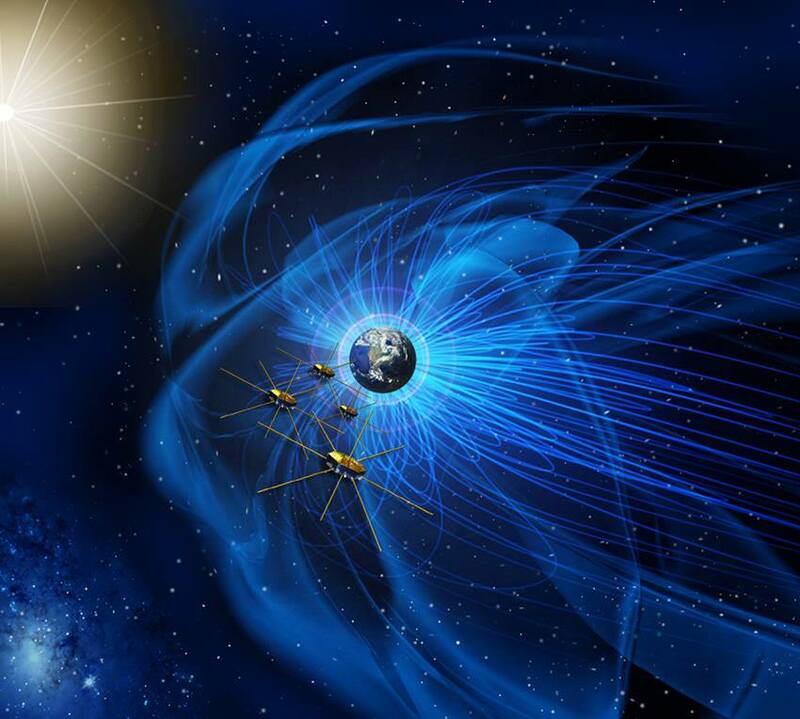 After its journey through the front of Earth’s magnetosphere, MMS will enter Phase 2, during which its orbit will steadily be enlarged, until it swings all the way out to 99,000 miles away from Earth. There it will move through an area of the magnetosphere behind Earth called the magnetotail – another area where magnetic reconnection is known to happen. MMS is the fourth NASA Solar Terrestrial Probes Program mission. Goddard built, integrated, and tested the four MMS spacecraft and is responsible for overall mission management and mission operations. The Southwest Research Institute in San Antonio, Texas, leads the Instrument Suite Science Team, with the University of New Hampshire leading the FIELDS instrument suite. The MMS mission was launched on a United Launch Alliance (ULA) Atlas V rocket on March 12, 2015. ← Get Ready For New Images Of Pluto!